Have you ever visited the campus of a business and found breathtaking artwork featuring their logo? Have you ever wondered what talented artist they commissioned for such a piece? You may be surprised to hear that the more skilled sign shops are able to produce markers that resemble works of art. 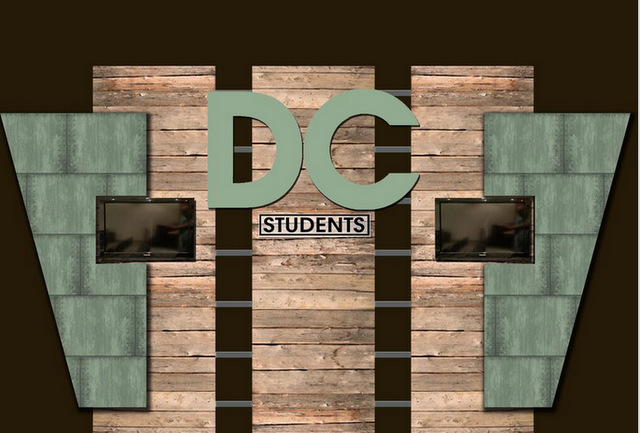 Discovery Church found this out when they contacted the friendly professionals at Citrus Sign Studio for student stage graphics for Winter Garden, FL. With three locations in the Greater Orlando area as well as online offerings, Discovery Church is a successful non-denominational, Christ-centered church. They believe in what Jesus had to say and try to obey all that he commanded. Their mission is to make disciples of Jesus. As part of their mission, they help the hungry, poor, and homeless with their LoveWorks campaign. A look at the wall before the display! When an organization that is providing such valuable services to the local community came to us for auditorium stage graphics for Winter Garden, Florida, we were happy that we could be of service. 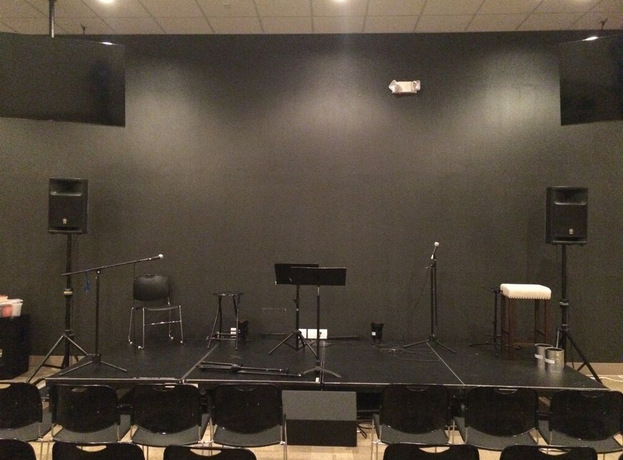 Discovery Church Southwest recently built a new campus on South Winter Garden Vineland Road in Winter Garden, and it featured a new area just for teens as part of Pastor Bob Lourdel’s plan to revamp the church’s teen worship experience. This new area had a stage that they wanted to give dimension and a sense of place. Citrus Sign Studio was up for this task! This custom wall display makes a huge difference! 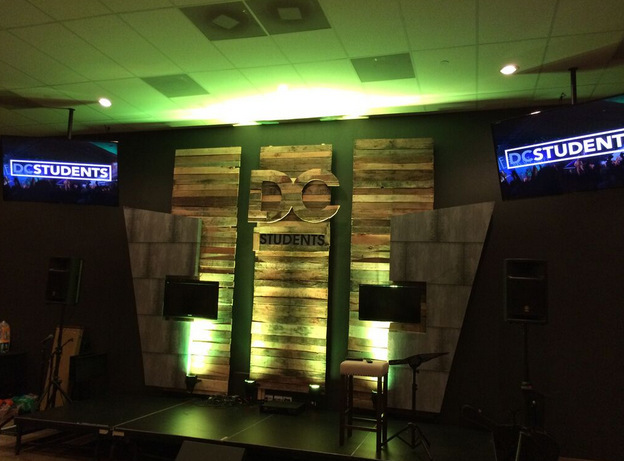 Discovery Church had a general idea of what they wanted, and they let us run with their vision. We provided them with a proof, which they loved, so we got down to work. Most of the graphics are made from wood, which is a great interior material. The “DC” is set off from the background to make it pop. We mounted the whole setup with spacers to add even more dimensionality. As you can see from the pictures, the look is astounding when the spotlights are on. 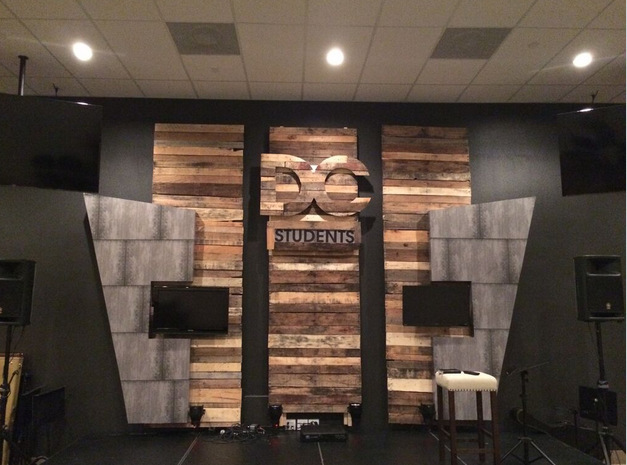 In the end, the students had a cool place to call their own, and the church was completely satisfied. Whether you operate a local nonprofit or a multinational corporation, we have the top quality materials, state of the art equipment, and knowledgebase necessary to fabricate any signage you may want. The only limits are your imagination and possibly your pocketbook, though we are pretty good at working with that too. When you contact us, we listen carefully to your goals and perform a site survey, taking measurements and making drawings. Our graphic designers then create proofs based on your needs and budget. Once you are happy with the design, we get to work manufacturing your new marker. We then work with your schedule to install it at a time that is convenient for you and causes the least disruption to your company. We are then available for any sign repairs or maintenance. You would be hard-pressed to find this level of service with an online sign company. Are you in need of some breathtaking graphics for your venue? Contact us today for a free consultation!